Remember those old commercials for Reese’s Peanut Butter Cups? “You got chocolate in my peanut butter!” The takeaway from this goofy series of ads was that sometimes, combining two different things is absolutely delicious. Today, I’m covering a game that blends two of my favorite things: giant monster movies, and the designer of my favorite game of all time, Magic: the Gathering. King of Tokyo is a very flavorful, light dice game, created by the great Richard Garfield. Though Garfield’s magnum opus is Magic, I’ve also enjoyed many of his other games, especially RoboRally and The Great Dalmuti. King of Tokyo, though it’s relatively new, has become one of my favorites, as well, and I’ve played quite a few games in the short time since I obtained my copy. 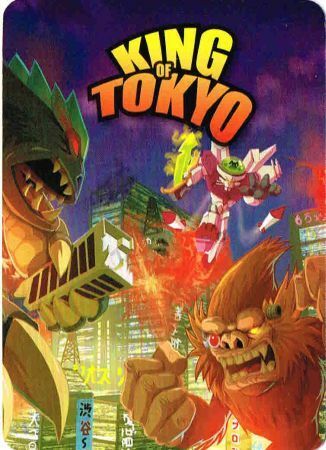 As you might expect from the title, King of Tokyo is all about a group of giant monsters, all duking it out in Japan’s oft-attacked capital. The monsters, represented by cardboard stand-ups, are reminiscent, if not blatant copies, of famous film creatures. There is a giant lizard, a mechanical dragon, a squid-faced monstrosity, and my favorite, a rabbit-shaped giant mecha armed with missiles, named Cyber Bunny. The characters are well illustrated in a comic-book style, and are guaranteed to bring a smile to the face of any monster movie fan. A slick player board, with two wheels for tracking health (hearts) and victory points (stars), is provided for each monster. There are two ways to win: be the first monster to earn twenty stars, or reduce all other monsters to zero hearts. Sounds easy, right? Not so much, with a handful of other giant monsters out to do the same thing. 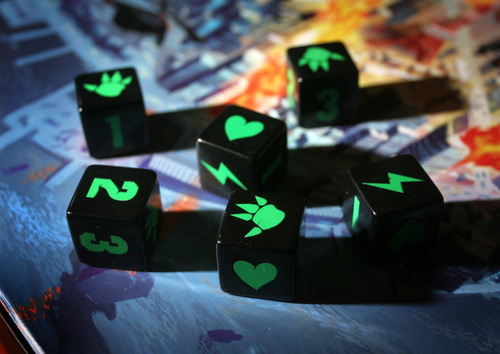 A set of eight custom dice are included, though only six are needed in most games. On a player’s turn, they roll the dice up to three times, keeping as many as they like after each roll, as in Yahtzee. The faces of the dice are 1,2,3, heart, claw, and energy. Rolling three of a particular number will earn the player stars (three 2s counts as two stars, for example). Hearts heal damage (unless your monster is in Tokyo; more on this later). Claws do damage to other monsters, while rolling energy awards green cubes, which can be used to purchase power up cards. A small game board, representing Tokyo, has room for one monster in a 3 or 4 player game, or two in a 5 or 6 player game. Entering and leaving Tokyo is where the decision making really comes. If Tokyo is empty, and you roll at least one claw, you must enter Tokyo, scoring one star in the process. You score two more stars each time you begin your turn in Tokyo. However, the monsters on the outside want in, and when they roll claws, any monsters in Tokyo take damage, but can choose to flee, allowing the monster that damaged them to take the spot. It’s not all bad, though, because rolling claws while you are in Tokyo damages all the monsters on the outside. 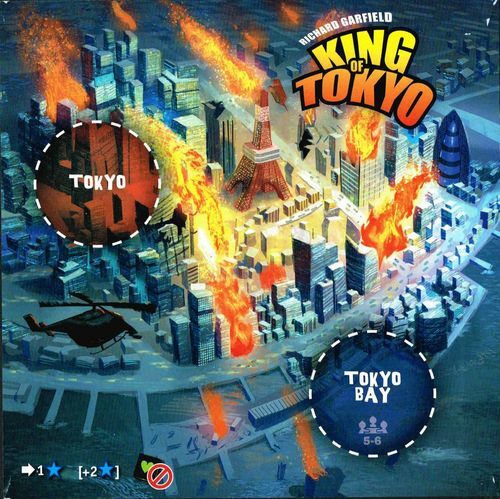 The push and pull of knowing when to stay in Tokyo, and when to leave, make for some great decision making, giving King of Tokyo a unique strategy element that elevates it higher than similar games like Zombie Dice. Unsurprisingly, for a Richard Garfield game, the included power up cards drastically alter the shape of the game, allowing monsters to break the rules. Three cards are turned up at any given time, and if you have enough energy, you can purchase one at the end of your turn. There is a huge variety in the cards, ranging from simple things like scoring a set amount of stars, or healing a few hearts, to game-changing abilities like an extra reroll, an extra die to use, or, my favorite, a card that scores you nine stars if you roll one of each face. The cards add variety and even more significant decision making to the game. 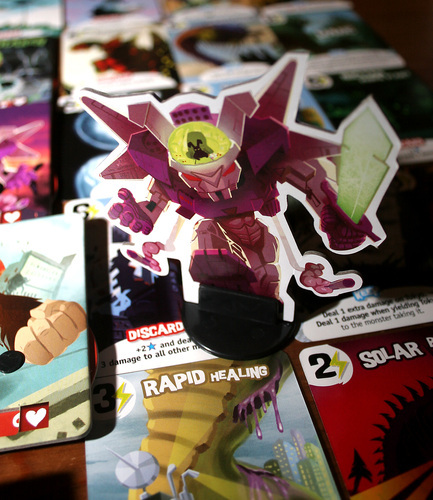 I am totally enamored of King of Tokyo. It plays very quickly, ranging from 20 to 45 minutes, depending on the number of players. Each game feels very different; sometimes, it’s an all out brawl, others, it’s a less interactive race for stars. The theme is extremely effective, and the component quality is top notch. King of Tokyo is one of the best warm-up or filler type games I own, and I highly recommend it to any gamer. Thanks to boardgamegeek.com users Mike Hulsebus and Raiko Puust for the pictures. Check out the rest of this month’s Game Night Blog Carnival entries here.